Raising bran, or sultana bran, is manufactured by several companies under different brand names. This cereal was first invented in the 1920s. The first brand of raising bran on the market was Skinner's Raisin Bran. The name “Raising Bran” used to be trademarked but is now considered generic because it merely describes the cereal's ingredients. 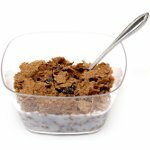 Raisin bran cereal has high content of dietary fiber that benefits our health in several ways. However, some criticize Raisin Bran for containing too much sugar. The matter is that raisins naturally contain much fructose. To celebrate the National Raisin Bran Cereal Day, you can eat it for breakfast or use for cooking something delicious – for example, raisin bran muffins. In a medium bowl, combine 4 cups Raising Bran cereal and 2 cups buttermilk. Let stand until softened. In another bowl, whisk together 2 cups flour, 2 tsp baking soda, and 1 tsp salt. In the third bowl, whisk together 2 eggs, 1 cup sugar, and 1/2 cup oil. Stir into cereal mixture, fold in flour mixture. Lightly oil muffing cups, scoop the batter into the cups and bake at 400 °F for about 20 minutes.